Find your next star employee here. At SCL and ISyE, we have outstanding students who are intelligent, innovative, self-motivated, accomplished, and have a strong work ethic. Depending on your staffing needs, we offer a variety of opportunities for you to engage and recruit these exceptional students. *If you identify an ISyE/SCL student that you would like to meet with on campus, we would be happy to reserve a conference room for you at ISyE for that purpose. If you have a supply chain and logistics-specific opportunity or need, the Supply Chain & Logistics Institute can assist. Amongst its various activities, SCL hosts four dedicated supply chain and logistics recruiting fairs each year. These “Supply Chain Days” are attended by ISyE and other students specifically interested in the supply chain and logistics field. Priority placement is given to SCL’s member companies, but if space is available, other companies are invited to host a table. For more information relating to Supply Chain Day, please visit https://www.scl.gatech.edu/outreach/supplychainday. You can also send us a quick note via our online contact form. SCL also works with organizations to host dedicated company-specific events, host company representatives to deliver class lectures, foster and conduct meetings with Georgia Tech faculty, serve as a matchmaker for interns, and identify student group projects. For questions relating to these initiatives, send us a general question. If you have a current opportunity/position, forward a job description containing the below to info@scl.gatech.edu. 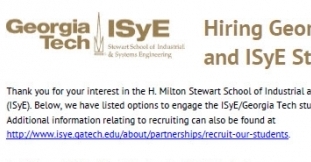 The position will then be posted to ISyE's IE Job Placement site (T-Square) which is monitored by students who are actively seeking employment opportunities. 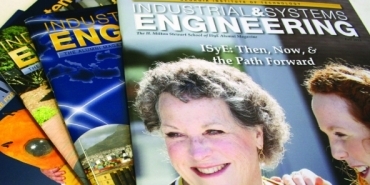 The Georgia Tech IISE Chapter hosts an ISyE Career Fair twice a year (Spring and Fall). There are typically ~300 students in attendance, making this is a good opportunity to reach a large GT student audience. For the next scheduled event, please visit GT IISE’s website. For questions, contact iiegeorgiatech@gmail.com. 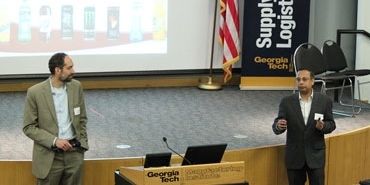 Through GT IISE, companies can host an information session on the Georgia Tech campus. Georgia Tech's Center for Career Discovery and Development (C2D2) assists students and companies through on-campus recruiting, job postings, a resume book and support of an Internship/Co-op Fair. 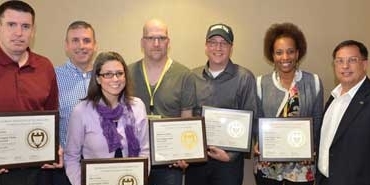 Visit http://www.careerdiscovery.gatech.edu to learn how to participate in their various offerings throughout the year (e.g. Virtual Career Fair, job postings, employer information sessions). For current or potential employers, visit the C2D2 site to learn how to participate in undergraduate and graduate co-op or internship programs. Whether you wish to employ students in domestic and/or international positions, the Center can assist in meeting your workforce and training needs. 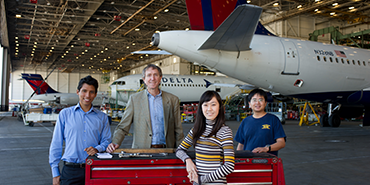 As part of their services, the Georgia Tech Alumni Association hosts an annual career fair and networking events, and supports a job database for GT alumni and potential employers. Please visit http://gtalumni.org for more information. Participate in a Career Fair on the Georgia Tech campus to enhance your company’s visibility to future job candidates by meeting some of the top students in the nation. The Georgia Tech IISE Chapter, a student run organization, sponsors job fairs and other recruiting events for ISyE students. For information on general career fairs at Georgia Tech, please visit Georgia Tech's Career Services website. Work with a team of Georgia Tech students first-hand, by sponsoring an individual or group of students to work on a supply chain related project. Senior Design provides students with first-hand experience in solving real-world problems in a team environment. Student teams select a major design project from a company or not-for-profit organization and exploit all available resources in order to develop a solution for the project client. For more information about the program and to submit a potential project please visit http://www.isye.gatech.edu/seniordesign/. The program’s summer term is dedicated to the Capstone Industry Experience in which students apply their knowledge and skills to real-world supply chain engineering projects. Students work in teams with faculty and professional mentor support. Prior to the summer term, team assignments (students and faculty) are determined, and teams select specific projects from a portfolio of projects offered by sponsoring business, government, and international non-government organizations. Each sponsoring organization provides operational support for the project team and assigns a mentor to actively work with the team during the project. During the summer term, teams complete both field work periods (typically on-site at the industry site) and on-campus work periods (preparing and presenting project outcomes). 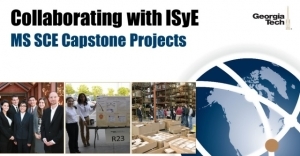 For more information relating to the program, please visit https://www.isye.gatech.edu/capstone. At the conclusion of the program during the summer semester, each student completes a 6-credit-hour applied analytics practicum. For the practicum courses, cross-disciplinary teams of students work with companies and organizations on real analytics projects. Teams consist of MS Analytics students from each track, to bring each of their specializations to bear in an integrated solution. Team are advised by appropriately-selected faculty in each of the disciplines. In this way, interdisciplinary learning is emphasized in practice as well as in the classroom. It is expected that some students may want to pursue an applied analytics internship in place of the practicum course. When such cases are approved, the internship would substitute for the applied analytics practicum requirement. Unpaid internships could receive the same academic credit as the practicum course; however, because paid internships may not be taken for credit, those students would be required to take 6 additional credit-hours of electives. For more information relating to the program, please visit http://www.analytics.gatech.edu/curriculum.